Free shipping over RM 100.90 purchase. 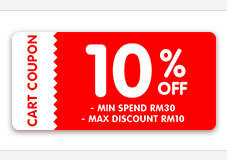 Shipping fee is free when purchasing above RM 100.90 in a cart. Satisfied with the purchase with good quality as the picture show. It looks exactly like the one posted... thanks for the nice wrap. high quality product and i am satisfied with it.will recommend to my friends. Receive in good condition. Good quality. Will highly recommend.